Get your dirndls and lederhosen ready for our second ever WHOA-ed adventure that’s exclusively for WHOAlums and the men they love! 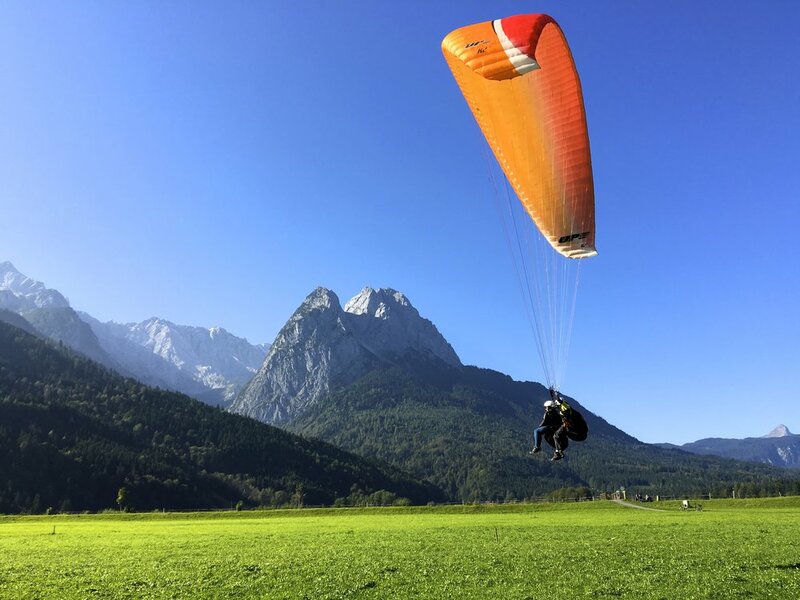 We’ll start by going off the beaten path to hike, bike and paraglide in picturesque Bavarian towns, and end with beer, dancing and more beer in Munich at the Oktoberfest. You'll get to experience local spots and celebrate like true Bavarians do. This is the best, most unique way to take in all Bavaria has to offer at this time of year! *Putting down a $500 deposit will reserve your spot on this adventure (which is a good idea because it always sells out fast)! You'll be invoiced and must pay in full at least 3 months before the adventure start date. All deposits are non-refundable. OKTOBERFEST TIPS & TRICKS + FUN FACTS + GERMAN 101 + FAQ + MORE! BEER, MOUNTAINS & MEN IN LEDERHOSEN?! Danke! We'll be in touch soon! Arrive at the Munich Airport (MUC) by noon to meet the group. Once we're all together, we'll hit the road and head to the picturesque town of Garmisch, nestled in the foothills of the Bavarian Alps. We’ll spend the night in a charming guest house that feels straight out of a fairy tale, and feast on a traditional Bavarian meal (complete with some of that world famous bier)! Bright and early, we'll head to the famous Olympic Stadium where we'll hike through the dramatic Partnachklamm gorge up to a hidden beer garden that overlooks the Bavarian Alps. After enjoying a much deserved beer, we'll take vintage cable cars down the mountain. Next stop: paragliding! We'll take off and soar over the Zugspitze, the highest mountain in Germany. (Note: Paragliding requires specific wind conditions, so depending on the weather the schedule of this day might flip flop.) In the afternoon, we'll hit the road to Füssen and make a stop in Austria to cross the world's longest pedestrian suspension bridge! (Did we mention this trip was epic?!) You'll have the evening free to explore and enjoy the idyllic Bavarian mountain town. After breakfast, we'll hop on bikes and take the famous romantic road towards Neuschwanstein Castle. Once we arrive, we'll park our bikes and take an off the beaten path hike to the palace of eccentric King Ludwig. We'll cross the famous Marien Brücke before we continue hiking up to get the most spectacular views of the castle and enjoy a little picnic lunch. Afterwards we'll head back to Munich, with a quick stop for some pre-Oktoberfest dirndl shopping. You'll have the evening free to explore, shop and hit up a few of our favorite local joints! Watch out Oktoberfest - here we come! Our WHOA crew has a coveted reservation at the famous Löwenbrau tent, where we'll spend the day in our dirndls indulging in the brezn and biers of Munich! Expect to be dancing on tables with beer in hand well into the night while you discover firsthand why Oktoberfest is one of the biggest and best festivals in the world! Included: Breakfast, Dinner + One Big Oktoberfest Bier! Today, we'll cruise the historic streets of Munich (dirndls and lederhosen optional) with Mike's Bike Tours. It's the best way to see the city and learn about its rich history! We'll end the trip riding through the beautiful English Garden to the Chinesischer Turm (the second largest beer garden in the world) for some much deserved refreshments! Itinerary subject to change based on availability and unforeseen conditions, but that's part of the adventure! Even when things change, trust you'll be well taken care of with WHOA quality, professionalism, and TLC!